Oh pasta, how I love you. Carbs are a good friend of mine as are bacon, eggs, and cheese, all key ingredients in the Italian classic carbonara. It’s a simple dish but also an easy dish to mess up. Add the pasta without tempering the eggs first and you might end up with an unappetizing scramble. I topped my carbonara with a bunch of green beans because veggies are important and I like my veggies covered in silky sauce and bacon. Traditional carbonara is veggie-free and so I apologize to all you traditionalists, go authentic by going veggie-free. Using dried pasta is also important. Fresh pasta is amazing, but it actually doesn’t hold onto sauce as well as dried pasta. More important than carbonara’s veggie-less state or pasta is the black pepper. Go big or go home as freshly cracked black pepper gives carbonara the blast of flavor that it’s iconic for. Cut bacon into 1/2″ pieces and cook until browned and crisp. Drain on paper towels. Save 1 tbsp of bacon fat. Whisk 2 eggs in a large heat proof bowl. Add bacon fat, parmesan, salt, black pepper, and red pepper flakes. Whisk together. Cook pasta till al dente. Drain pasta reserving 1/2 cup water. Slowly pour hot pasta water into the egg mixture, whisking vigorously. Add bacon and pasta to the mixture. Toss to combine and serve immediately. With the cold weather dragging on and on I’ve burnt out on heavy winter food. This mushroom dish, inspired by one of Nigella Lawson’s recipes, is the perfect quick fix. It’s hearty enough to serve as a main dish but light enough, with a strong lemon finish, to remind you that warm weather is on the way! 1. Toss all ingredients except linguine in a large bowl. Cover and let sit for at least 1 hour. 2. Cook pasta till al dente. Drain loosely, reserving about 1/2 cup of pasta water. 3. 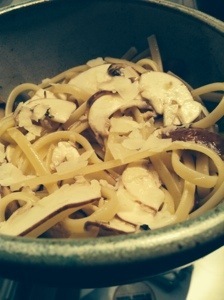 Add pasta and reserved pasta water to the bowl of mushrooms. 4. Toss and serve immediately. Garnish with shaved Parmesan and parsley if desired. The other night I looked at the clock and it was 9:30pm. I hadn’t had dinner yet, was starving, and had lots of work left to do. I had two options: delivery or get creative. Not one to turn down a challenge, I decided to get creative. When you need to cook a meal fast it is all about deciding on an easy base. 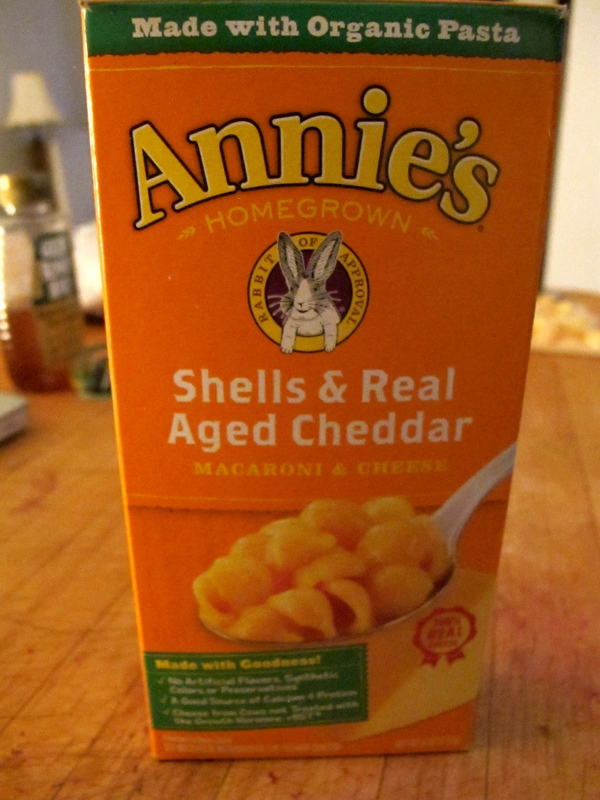 My go-to is Annie’s Mac & Cheese. I grew up on Annie’s and I still love it. It is never a bad pick. 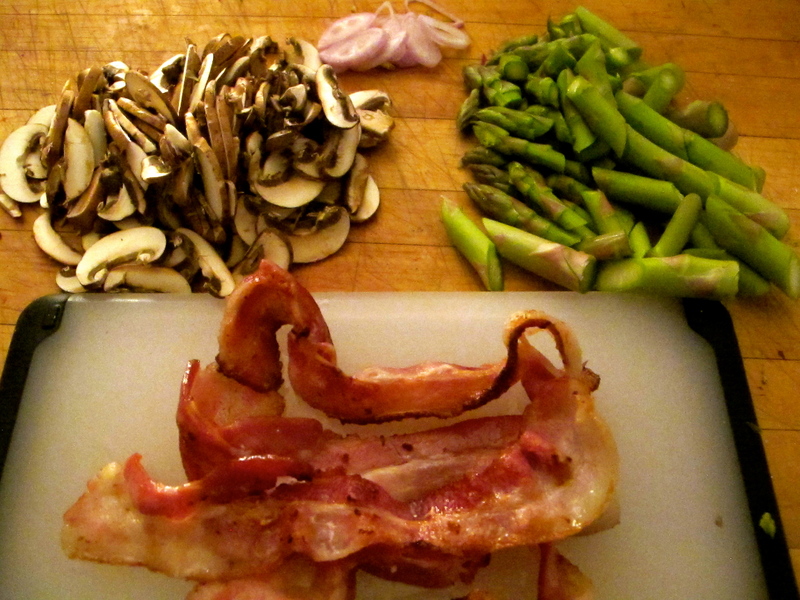 Rummaging through the fridge, I pulled out butter (duh), milk, asparagus, a shallot, mushrooms, mozzarella cheese, and bacon (why not?). Next, I headed to the pantry for some bread crumbs and olive oil. When you make a loaded Mac & Cheese the key is to use up the stuff you have in your fridge. Cauliflower? Throw it in! Brussels Sprouts? Chop those suckers up! Mushrooms? I am in love! This takes a grand total of 30 minutes max. and the left overs are to die for. Cook bacon in a small oven-safe skillet or caste iron pan. When crisp, remove from pan and chop coarsely. Sauté shallots and mushrooms in bacon fat. Make ‘cheese sauce’ in a small bowl following the boxes instructions. Set aside. Combine breadcrumbs and butter in small bowl. Set aside. Add cooked pasta, bacon and mozzarella to vegetables, stir until combined evenly. Pour cheese sauce over top of the pasta mixture. Top with breadcrumbs and some black pepper. Broil for 3-5 minutes or until golden brown and bubbling.